Offering you a complete choice of products which include displacer level switch and side mounted level sensor. We are maker of astounding quality Displacer Level Switch which caters different necessities of building commercial enterprises. Given level switch is broadly utilized for sensing level cutoff as a part of low thickness liquids to abnormal state thickness liquids. Notwithstanding this, our quality masters stringently check this level switch on different quality parameters to guarantee its exact execution. Our customers can profit this level switch from us at business sector heading cost. We make excellent quality Side Mounted Magnetic Level Switch which caters diverse requirements of engineering industries. 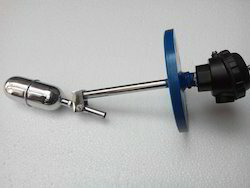 A provided level switch is widely used for sensing level limit in very low-density fluids to high-level density fluids. In addition to this, our quality experts stringently check this level switch on various quality parameters to ensure its accurate performance. Our clients can avail this level switch from us at market-leading prices. Looking for Level Sensor ?